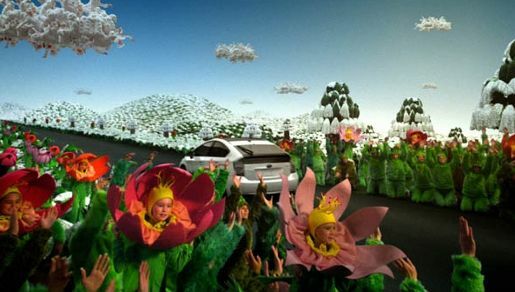 Toyota is championing the landscape-friendly Prius with a set of animated commercials, in which the grass, water, clouds and sun are all made out of people. The campaign is designed to illustrate the idea behind the Prius’ design: harmony between man, machine and nature. The first spot, “Harmony,” depicts a lifeless, monochromatic landscape brought to life by the car’s passage. Welcome to Harmony, where man’s wants and nature’s needs agree. Using the wind, sun and advanced hybrid technology, Prius balances our demand for mobility with the natural order of things. It’s a hybrid like no other, the first to benefit from three cycles of design evolution. The 2010 Toyota Prius. Moving Forward. Music is the Bellamy Brothers hit “Let Your Love Flow” performed by Petra Haden. With Hybrid Synergy Drive, the Prius can provide drive power independently from either the gasoline engine or electric motor, or from both simultaneously. The result is more powerful driving performance with low emissions and an EPA-estimated combined 50 mpg rating. It’s a hybrid like no other, the first to benefit from three cycles of design evolution. The 2010 Toyota Prius. Moving Forward. Using the wind, sun and advanced hybrid technology, Prius balances our demand for mobility with the natural order of things. The Prius, with available solar power, now helps to cool a more spacious interior. It’s a hybrid like no other, the first to benefit from three cycles of design evolution. The 2010 Prius. Moving Forward. The Harmony spot was developed at Saatchi & Saatchi, Los Angeles, by executive creative director Mike McKay, creative director Andrew Christou, integrated design creative designer Ryan Jacobs, associate creative director/art director Sean Farrell, art director Tito Melega, copywriter Simon Mainwaring, director of integrated production/multimedia Tanya LeSieur, senior agency producer Jennifer Pearse. Filming was shot by director Hideaki Hosono (Mr. Hide) via The Sweet Shop, Los Angeles, with executive producer Stephen Dickstein and Susan Rued Anderson, director of photography John Toon, art director Guy Threadgold, production designer Rick Kofoed, line producer Larissa Tiffin, global executive producer Sharlene George. Offline editor was Nathan Pickles. Online editor was Avi Oron at Bikini Edit. Post production was done at Perceptual Engineering by producer Jon Baxter, Flame artists Mike Robinson, Puck Murphy, Leon Woods, Amber Wilson, Melissa Goddard and Ian Quigley, 3D artists Glenn Wilson and Rachel Guidera. Further VFX work was done at Fin Design, Sydney, Lizard Lounge Graphics, Wellington, and Brickyard, Los Angeles. Sound was designed at Human Worldwide, and mixed at Lime Studios. Music was produced at Agoraphone. Casting was directed by Suzanne McAleer. Read more on the making of the video in the Videography interview with Mr Hide and Jon Toon.